This is becoming a bit of a litany these days but here is another distillery, Tullibardine, that I know very little about and have very little experience of. In fact, it is entirely possible that this is my first Tullibardine–though I do have a vague memory of having tried one or two some years ago (that, however, was before our children were born and permanent concussion set in; indeed, I also have a vague memory that there was a time when we went out regularly to the movies etc.). The length of the preceding digression suggests that it is best if we get right to it. Nose: Musky citrus along with some malt and a mild grassiness. A bit of pepper too. The citrus gets brighter (and also nicely bitter) with time and air–think lime and lime zest. There’s just a bit of creamy sweetness below that too and then something biscuity. Gets a little dusty with water. Palate: Leads with malty sweetness and then there’s an extended transition to tangy, citrussy notes. By the third sip the sweetness and citrus have merged very nicely and it’s rather mellow and pleasant. No interesting change with water. Finish: Long. The sweetness and the citrus both remain but there’s a grassy, metallic edge that I don’t quite like. And water really intensifies that metallic note. Not nice. Comments: The finish pulls this down for me. On the whole, pleasant but unexceptional. Fortunately, it’s priced accordingly (at least in relation to its age). Oh, and hold the water. 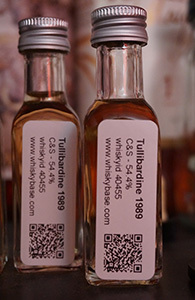 This entry was posted in 80-84 points, C&S, Tullibardine, Whisky by Bottler. Bookmark the permalink.